This year sees new ships and itineraries on the horizon in European waters and since cruising offers a cost-effective, stress-free way to explore the continent, with meals and entertainment included in a single tariff, it's a great option for budget-tight or nervous travellers. From the dazzling spectacle of the springtime Dutch bulbfields to the French Atlantic coast and Portuguese ports where great maritime explorers set sail, this large chunk of the continent also covers Spain, Germany and Belgium. This year, boutique line Azamara Club Cruises unveils intensive itineraries in nine countries, providing passengers with in-depth insights into destinations including France and Spain. The latter features a seven-night cruise leading in at £1,391pp and visiting Seville, Malaga, Almeria, Valencia, Palma de Mallorca and Barcelona. On the inland waterways The River Cruise line has teamed up with celebrity gardener Charlie Dimmock for green-fingered sailings with visits to Holland’s renowned Keukenhof Gardens and the National Botanic Garden of Belgium. There is also a new ‘Captain’s Choice’ Heart of Holland sailing on the line’s popular heritage vessel, Lady Anne. These cruises include coach and ferry travel and are ideal for clients that prefer not to fly. 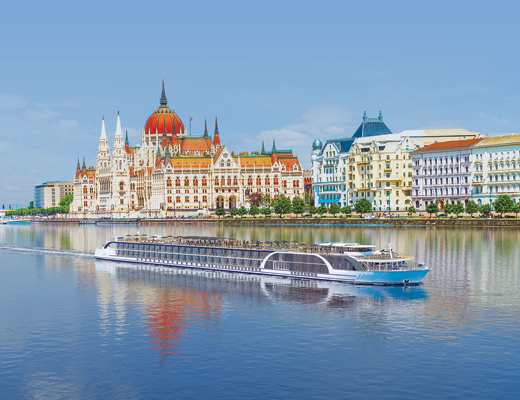 On the Danube, AmaWaterways is launching the ground-breaking AmaMagna, which will be twice the width of other river ships yet carry just 198 passengers. In Portugal CroisiEurope debuts Amalia Rodrigues on the Douro, the sixth premium-rated ship to join the fleet, and AmaWaterways launches AmaDouro, its second vessel on the river. Book it: Azamara Club Cruises has a 14-night Tall Sails and Remembrance itinerary commemorating the 75th anniversary of the Second World War D-Day landings, with options to visit the beaches and memorial sites. It starts from £4,079pp, departing May 28, 2019. The River Cruise Line’s seven-night Springtime in the Gardens of Holland and Belgium itinerary, hosted by Charlie Dimmock on the four-star MS Serenity, is from £945pp, departing May 3, 2019. This sun-soaked region includes Greece, Croatia, Italy and lesser-known destinations such as Corsica, which is the closest Mediterranean island to the UK. Being named in Southampton in March, MSC Bellissima is the latest addition to the ever-growing MSC Cruises fleet. The 4,500-passenger vessel is the second of the line’s Meraviglia-class ships and will include an indoor promenade with an LED ceiling projecting different scenes, Cirque du Soleil at Sea and the exclusive ‘ship-within-a-ship’ Yacht Club area. Bellissima will spend its first summer in the Western Mediterranean, with home ports at Genoa, Marseille and Barcelona. Launching in the Mediterranean this October, Princess Cruises’ new vessel, Sky Princess, will feature the line’s first ever ‘Sky Suites’, located on the top decks and with the line’s largest private balconies. The 3,600-passenger vessel’s maiden season will include a new six-night Mediterranean round-trip Rome sailing, which agents can combine with a Rome to Barcelona voyage to create a 12-night cruise option. SeaDream Yacht Club has announced new themed wine voyages for 2019. Visiting picturesque yachting ports in the Mediterranean, and ranging from four to 10 nights, itineraries feature private vineyard visits, wine tastings and gourmet dinners, plus exclusive activities such as truffle hunting in the Italian forests of Castello Delle Regine. Shearings Holidays is offering new Malta and Sicily cruises on CroisiEurope’s MS La Belle de l’Adriatique – and agents can add a two-night extension in Catania from £130pp. CroisiEurope itineraries on the same vessel include a seven-night round-trip Treasures of the Adriatic cruise from Dubrovnik, taking in Croatia, Greece, Albania and Montenegro. Book it: Seadream Yacht Club has a six-night Wine Voyage from Dubrovnik to Civitavecchia (Rome), also calling at Kotor in Montenegro, Taormina (for Etna), Sicily, Amalfi and Capri. Starting from £2,763pp, it departs on October 5, 2019. Shearings Holidays has an extensive collection of river cruises and some ocean cruises, including the seven-night Best of the Mediterranean cruise on CroisiEurope’s MS La Belle de l’Adriatique. Prices start from £1,629pp and include all drinks and flights, for October and November 2019 sailings. The dramatic scenery of Scandinavia is at its most breathtaking in the Norwegian Fjords, where typical sailings feature picturesque Stavanger, Bergen and Flam and the option to visit the capital, Oslo. Other cruises include the ultra Scandi-cool and culture rich cities of Copenhagen and Stockholm. Saga Cruises’ first new-build vessel Spirit of Discovery launches in July and will sail out of Dover. The 999-passenger ship, catering for the over-50s, will notably have 109 cabins for solo passengers and offer private home transfers. Also look out for Saga’s second brand new ship, Spirit of Adventure, coming in 2020. The growth of Viking Ocean Cruises continues apace with Viking Jupiter, the sixth 930-passenger ship in the fleet, launching this year, with another 10 on order. The vessels have understated Scandinavian decor and itineraries include the 14-night Viking Homelands Stockholm to Bergen cruise. Hurtigruten has announced it has ordered the construction of a third hybrid powered expedition cruise ship (to be launched 2021), continuing it’s quest to be the greenest fleet on the seas. The line’s first hybrid-powered expedition ship, and also a world first, MS Roald Amundsen embarks on her maiden voyage in 2019. The 2020/21 programme will see the launch of its second hybrid MS Fridtjof Nansen, which will visit Greenland, Iceland and the Norwegian coast and the line currently has savings of up to £1,000 on new expedition cruises for 2020/21 for bookings made by March 31. Book it: Hurtigren’s 12-day Astronomy Voyage starts and ends in Bergen. The science-focused winter cruise will offer the chance to learn about the Northern Lights and the cosmos, accompanied by one of three renowned astronomers who give onboard lectures and presentations. Stops include Art Noveau Ålesund, the Lofoten Islands, the world’s most northerly town of Hammerfest, and Tromsø. Priced from £1610pp, sailing are from now until March 2019 and October 2020 to March 2021. The northernmost sector of Europe encompasses fascinating Baltic countries Estonia, Latvia and Lithuania. Cruises here also overnight in the stunningly beautiful Russian city St Petersburg and visit Poland. This year Scenic is launching the ultra-luxurious discovery yacht Scenic Eclipse, from which passengers will be able to embark on unforgettable excursions on the ship’s helicopter and seven-seat submarine. The inaugural season will feature a selection of Baltic sailings. Eastern Europe is the place to discover the ‘other side’ of the Danube, the great river that flows through Bulgaria, Serbia and Romania to the wildlife wilderness of the Danube Delta at the Black Sea. Amadeus River Cruises pioneered sailings in this area and for 2019 the line welcomes its new silver-class ship Amadeus Star, with onboard facilities that include a spa and hair salon. Book it: Scenic’s 11-night Baltic Tradewinds Route Amsterdam to Copenhagen sailing includes calls at Helsinki, St Petersburg, Tallinn, Klaipeda and Gdansk. It is priced from £6,515pp and departs June 9 2020. CroisiEurope has a 10-night round-trip Budapest cruise on the Lower Danube, sailing through Bosnia and Serbia. Priced from £1,499pp it departs May 5, 2019. Sailing closer to home, the North Sea is the gateway to Ireland, the atmospheric Scottish Isles and onwards to Iceland. Shearings Holidays has unveiled a raft of new cruises in conjunction with Cruise & Maritime Voyages. All sailings have UK departure points and are combined with the operator’s extensive coach network to reach the embarkation ports. Celebrity Reflection will return to Dublin in 2020. The only major cruise line to base a ship in Ireland for the third consecutive year there will be six sailings, with a new 10-night Irish Sea itinerary calling at destinations in Scotland, Ireland and England, including Portland in Dorset. For a unique experience suggest clients combine sail and steam in Scotland with a new itinerary from Great Rail Journeys. For 2019 the holidays by rail specialist is chartering the 54-passenger MV Lord of the Glens, which is designed to navigate the inland waterways of Scotland and the open sea. Book it: Shearings Holidays’ 11-night Iceland & Faroe Islands cruise aboard MS Magellan calls at Dublin, Reykjavik, Isafjordur, Akureryi, Klaksvijk and Torshavn. Priced from £1,054pp it departs Liverpool July 9, 2019. Great Rail Journeys’ 12-night trip featuring Edinburgh, The Jacobite Steam Train and a Scottish Islands & Lochs Cruise, combining a Caledonian Canal cruise with a rail tour in the Highlands, is priced from £2,695pp, with departures on April 30 and September 17 2019.